Coach Bobby Dodd developed a total of 21 All-America football players during his illustrious career. None, said Dodd, was greater than center-linebacker George Morris. At 6-2, and 205-pounds, Morris became the immovable middleman in Dodd’s Georgia Tech line during the early 1950s. That decade was a Golden Era of Tech football during which the Ramblin’ Wreck ripped off 23 straight victories. Defense was the key to the streak, and Morris was the key to the defense. During his junior and senior seasons, only two opponents managed to score more than one touchdown against Tech. The 1951 campaign produced an 11-0-1 record which included a regular-season 14-14 tie with Duke and a 17-14 victory over Baylor in the Orange Bowl. Could things get any better? Well, in 1952 senior captain George Morris spirited his team to a perfect 12-game march, climaxed by a 24-7 triumph over Mississippi in the Sugar Bowl. Alabama nearly spoiled that perfect season, but a Morris fumble recovery deep in Tide territory led to a Tech touchdown and a 7-3 victory. 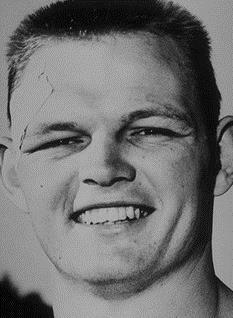 Morris made 114 unassisted tackles over the 1952 season and earned All-America recognition.